Our Scratch Off USA Map makes a fantastic send-off gift for traveling families or couples. Not only is it a joy to use while traveling - it makes a wonderful keepsake that can be treasured for many years down the road. Celebrate How Far You've Gone: Commemorate every voyage with this unique and fun travel map. 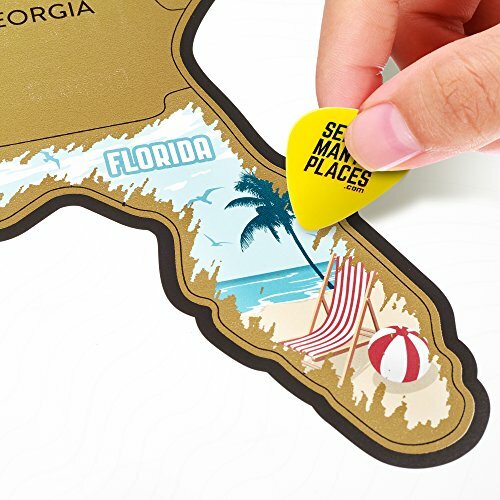 Use the plastic pick provided to scratch off the gold foil coating and reveal a full color state picture beneath. High Quality and Made in the USA: At 28 x 22", your travel memories wall poster is a common size and easy to frame and hang. Enjoy this keepsake at home, long after your trips are over. If you have any questions about this product by See Many Places, contact us by completing and submitting the form below. If you are looking for a specif part number, please include it with your message.